Shadow gets sprung from a stint in prison and falls down a rabbit hole into a Wonderland life that even he couldn’t make up if he tried. Suddenly his wife is dead, but her ghost visits him sometimes. Suddenly he’s under the guardian eye of Wednesday, who happens to have a bigger role in Shadow’s life than he’d care to admit. Suddenly he’s thrown into an unfolding saga in which he plays an integral part. Gaiman is always great fun to read. The humor he employs to poke fun at religion is greatly appreciated by this reader. 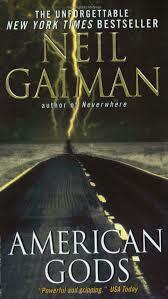 It’s always slightly irrelevant in tone, yet always on point and with a slant that only Gaiman can provide. The characters he creates are pensive and irritable and endearing. He weaves a tale of full of ins and outs that keep a reader entertained since one never knows quite what side road the characters must take in order to achieve their destination – stories within the story. Occasionally the work seemed a bit of a slog if dialogue seemed slow or of no import, but still highly recommendable as every Neil Gaiman book rightly should be. This entry was posted on Thursday, February 5th, 2015 at 15:48	and tagged with American Gods, american writers, book review, fiction, fiction writing, Neil Gaiman, stories of gods, writer, writing and posted in Uncategorized. You can follow any responses to this entry through the RSS 2.0 feed.